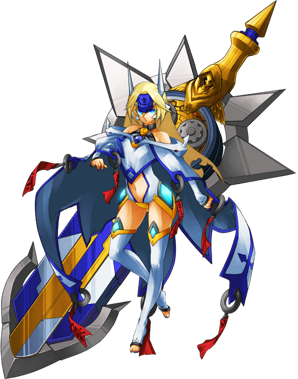 Difference between revisions of "Μ-No.12-"
Mu first appeared as the final boss of ''[[BlazBlue: Continuum Shift]]'', being unlocked once the true ending of story mode is completed. Mu-12 is physically identical to her original form, [[Noel Vermillion]]. 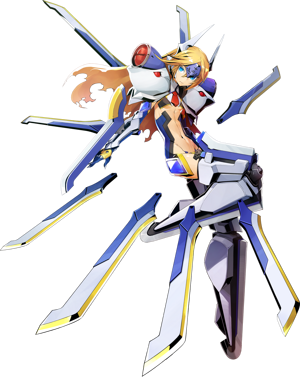 In [[BlazBlue: Continuum Shift]], her eyes have dilated pupils and are sometimes depicted as glowing a bright blue, but this trait disappears in the next two games. When out of combat, Mu wears a cloak very similar to [[Nu-13|Nu's]], but with a large blue jewel and harness attached to a small metal collar in place of Nu's much larger collar. Her jumpsuit is white, has slightly larger gloves, exposes her lower torso, and lacks pants, which she replaces with long white leggings. Her jumpsuit also has glowing blue jewels set in golden frames on her hips, which are also present on top of her leggings. The metal piece over her crotch is similarly golden. 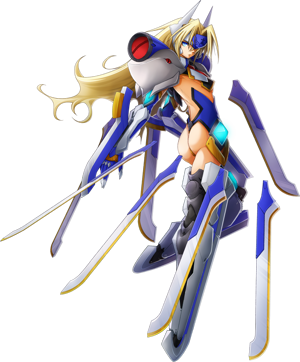 In place of Nu's seithr regulator, Mu wears a metal headpiece with her variant of the Prime Field Device symbol engraved into it and stiff, horn-like antennae, an article of clothing which she continues wearing in combat.